CARLSBAD, CALIFORNIA — Dec. 5, 2017– Jay Burkette was given the 2017 Ambassador Award at EDPA Access 2017. Jay Burkette is the Vice President of ExpoDisplays and has over 30 years of trade show experience. He was honored for his contributions at the Annual Dinner on December 1 in a ceremony in Carlsbad, California. Each year, five different awards are given to recognize amazing work in the industry. The Ambassador Award acknowledges an EDPA member who has made an outstanding contribution to the organization and the industry. Jay Burkette said of the honor, “I am not often at a loss for words, but at the recent bestowing of EDPA’s 2017 Ambassador Award, “I was totally caught off guard. To be recognized in this manner by your EDPA peers is an honor that I will not soon forget.” Jay resides in Tampa, Florida with his wife Suzie of 38 years. They have 2 sons and 4 grandchildren. Jay is also an accomplished stained / fused glass artisan and regularly donates art for the annual EDPA Foundation silent auction, which provides grants, scholarships and financial support to those within the trade show industry. 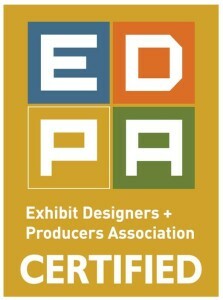 Since 1970, ExpoDisplays has been serving the trade show industry as an American Manufacturer. ExpoDisplays is a World-Class exhibit house in Birmingham, Alabama with a 47 year track record of creating extraordinary exhibits. ExpoDisplays is the manufacturer of the MultiQuad® exhibit system.